We used to have to wait until the summer before a presidential election to see all the fun and harsh ads candidates would run. Now, campaign messages are launching faster, earlier, and more frequently thanks to social media. So far, four politicians have announced they are officially seeking a place in the White House in 2016, and each has been hard at work coming up with different ways to drum up support, especially on Facebook (FB). CNNMoney worked with Facebook and social media analytics firm Socialbakers to figure out which contenders elicited the most chatter around their announcement -- and from whom. We also took a look at each campaign's Facebook page to see how they have been managed to date. Here's how each campaign stacks up. Engagement on Facebook pages. Rand Paul has the most number of likes on his Facebook page compared to his competition. The Kentucky Senator has more than 1.9 million fans on Facebook. Ted Cruz comes in second with 1.2 million, and Marco Rubio and Hillary Clinton are in third and fourth place with about 826,000 and 770,00 likes, respectively. Clinton didn't launch her Facebook page until the day she announced, so it's not fair to say one candidate is winning on Facebook based on page likes alone. More telling is the number of interactions on each page. According to Socialbakers, Paul had the highest number of interactions on his page within the first day of his announcement (191,823), while Cruz came in second with 162,010, and Clinton and Rubio each received 149,824 and 101,016 on their pages, respectively. Engagement on Facebook overall. Those numbers don't tell the whole story, though. People don't just talk about candidates on the campaign pages -- millions of people talked about them on their own News Feeds and timelines as well. 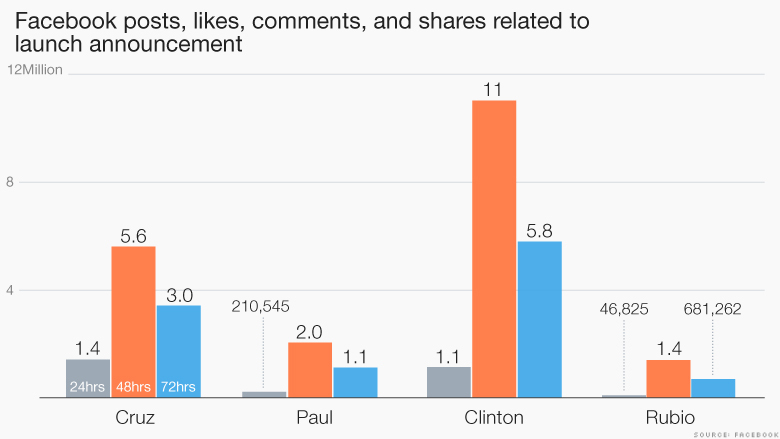 By that measure, Clinton's announcement generated by far the most chatter on Facebook. Within the first 24 hours of her official bid, about 11 million posts, and likes, comments and shares of those posts, took place around the news. On the second day, interactions were still high -- and peaked at over 5.7 million. Only Cruz came close to matching this level of noise when he told the country he was running. His name generated 5.6 million posts and interactions on the first day and 3 million the second day. Look who's talking. According to Facebook, young women 18 to 24 posted, liked and clicked twice as much about Clinton as they did about Cruz, Paul, and Rubio. Men aged 65 and over, on the other hand, were far more interested in the other three candidates than they were about Hillary. About 62% of posts related to Clinton were made by women during the first 24 hours of her campaign launch. Rubio also attracted more women than men: 54% of posts and interactions about him were created by women. The majority of interactions on content about Cruz and Paul came from men, at 53% and 58% respectively. Ted Cruz. Since confirming his run for the White House a month ago, Senator Cruz has posted to his official Facebook page over 50 times. The most popular piece of content, in terms of number of likes, was a link to his website announcing his support for Indiana Governor Mike Pence, after he signed a controversial religious freedom bill. "Indiana is giving voice to millions of courageous conservatives across this country who are deeply concerned about the ongoing attacks upon our personal liberties," his statement reads. On Facebook, the post has generated almost 52,000 likes to date. Rand Paul. Senator Paul's Facebook page has its share of negative campaign messages targeting Clinton. When Clinton made a big splash in the news by ordering at Chipotle, Paul responded with a picture of himself in front one of the restaurants. "I heard Chipotle is a great place for lunch these days..." the caption reads. The photo got over 45,000 likes and 1,700 shares. Hillary Clinton. Hillary Clinton's Facebook presence is the most thorough among all the candidates'. Her page is filled with photos and tidbits from her past -- starting with birth -- and features both personal and professional milestones. More recently, posts on Clinton's Facebook page have centered around recruiting volunteers to help with the campaign, soundbites from her rallies, and shareable quotes and statistics about her platform. There's also a few bumper sticker giveaways and even an animated GIF on National High Five Day, April 16, which received 5,400 likes. 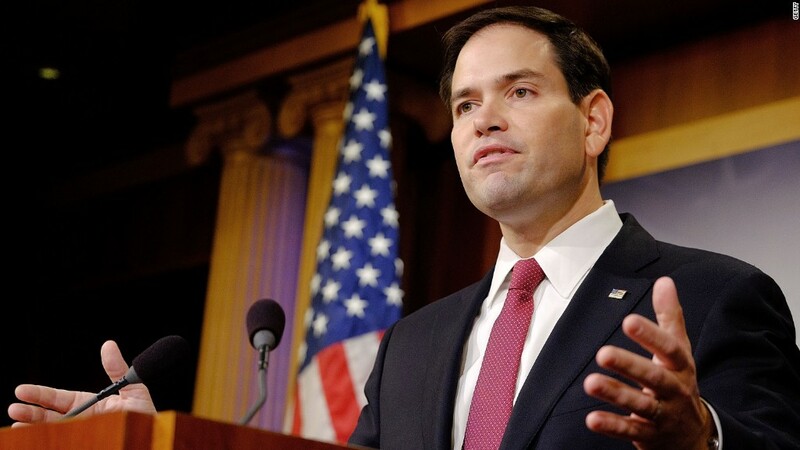 Marco Rubio. It's only been two weeks since the Senator from the Sunshine State announced his candidacy, but he and his team have already posted to Facebook more than 50 times -- as much as Senator Cruz has.